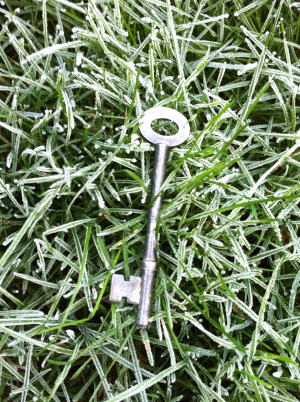 A key, discarded on frost-covered grass. What secrets of the universe wait its turn? What doors to the past can be opened? I lift the key, cold to touch. A glint of light reflected from dawning sun. Memories of a life, not mine, dance before my eyes. A child grows into a man. A wife and children follow. The children grown, someone loved is lost, loneliness of a man grown old. The man is him. He knows what I’ve seen. He smiles. We talk. The key unlocks a new friend. This is the prompt photo from the #100WCGU blog.